Hotel Barcelona Princess is a modern 4-star hotel located in the Forum area, within 7 minutes walking distance from the beach. 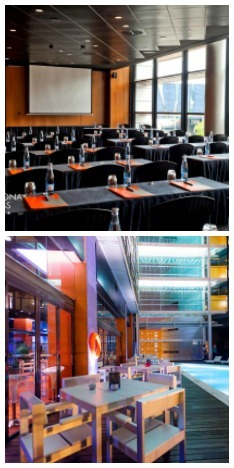 It is one of Barcelona’s most representative hotels and contributes to the city’s architectural splendor. It is located at Diagonal Avenue facing the CCIB (International Convention Centre of Barcelona) and Diagonal Mar Shopping Mall. The hotel boasts 363 modern and comfortable rooms distributed in 26 floors with complimentary WiFi, Mini Bar, bathrobe and slippers in all room types. This innovative and business oriented hotel offers attractive and quality services to all guests. The hotel has 6 meeting spaces, 4 of them with natural daylight, ideal for any kind of event. Its spacious facilities have free access for all guests and the business center has 6 computers with Internet access and free printing. The hotel has 2 heated outdoor pools, one of them located on the 23rd floor with nice sea views. There are also a solarium, gym, sauna and massage cabins. Excellent public transport options to the city centre, just 15 minutes by metro, Tram or bus. The Barcelona Sightseeing Tour stops behind the hotel and tickets can be purchased at Reception. Taxi stop is located behind the hotel. Enjoy spectacular views of Barcelona and the Mediterranean Sea at your feet.